How to Disconnect and Reconnect eBay to DSM? By doing this process, it may solve most of the problems that you will encounter in DSM such as information that are not the same in your eBay account and more. Note: This will not delete your listings, it is completely safe. 2. On General tab, at the bottom part of the page you will see eBay connection. Click "Disconnect from eBay" button. 3. Another window will appear confirming that you want to disconnect your eBay account. Click "Yes,Disconnect" button. 4. It should look like this (See image below). This means that your eBay account is now disconnected to DSM Tool. 2. It will redirect to the log in page of eBay. Enter the email address or username then the password. 3. 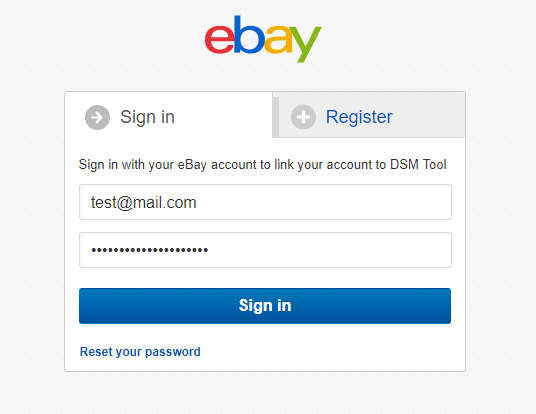 After logging in, eBay will an authorization to grant DSM Tool access to link your eBay account. Click on "Agree" button. 4. A confirmation page will appear that you successfully link your eBay account to DSM Tool. Once you received this, close the window/tab. 5. Go back to eBay connection and click "Step 2: After Login Click here" button. 6. Then a confirmation message from DSM Tool will appear to let you know that you successfully reconnect/link your eBay account to DSM Tool. How to connect to the New eBay API? By doing this process, you will be able to make your listings qualify to the new eBay catalog system. 2. On General tab, at the bottom part of the page you will see eBay connection. Click "Connect to new API" button. 3. It will redirect to ebay login page. Enter the email address or username then the password. 4. After logging in, eBay will ask for an authorization to grant DSM Tool an access to link your eBay account. Click on "I Agree" button. 5. A confirmation message will then appear on DSM Tool to let you know that you successfully reconnect/linked your eBay account to DSM Tool. Once, connected, you will now see the option to automatically assign your existing listings to ePID. To learn more about the New eBay Catalog System, click here.